Against the odds, call the former bookmaker in Frankfurt Hoechst the marathon into life. 3169 runners log in. Running legend Emil Zatopek is on May 17 in front of the East Gate of the Hoechst group launched – a run classic is born. Kjell-Erik Stahl (Sweden, 2:13:20) and Doris Schlosser (2:47:18), the winner Premiere. Already are 5529 runners at the start, making it the Frankfurt Marathon the largest road race in Germany. The winner Delfim Moreia (Portugal, 2:12:54) and the Landshut-Heidi Hutterer 2:36:38) deliver strong results. 250000 spectators cheered the runners on despite 12 degrees and rain. The Turk Ahmet Altun wins in a course record of 2:12:41 hours. In the women’s Darmstädterin Charlotte Teske wins despite walk break because of stomach pains in new German record time of 2:28:32 hours. Winner Dereje Nedi (Ethiopia, 2:11:18) provides a new track record, and the second and third place remained below 2:12 hours. In the women’s Charlotte Teske repeated in 2:31:16 their previous triumph – though she has to take a walk break again. For the first time, see the German Championships in Frankfurt – and Herbert Steffny (2:12:12), after an impressive final sprint, the first German winner and champion celebration. Charlotte Teske has this year the Dutch Carla Beurskens (2:28:37) to defer. Great: One-quarter of 7292 finisher remains under three hours. Hoechst AG withdraws as a sponsor, the Frankfurt Marathon precipitates. The Frankfurt Marathon holds in his new appointment in the autumn walk. 5300 messages are indeed a step backwards, but still it goes on with a reduced budget. The Scot Lindsey Robertson (2:13:30) and winning the Kölnerin Anabel Holtkamp (2:45:21). Take the train as title sponsor takes. but 5575 messages mean only a small increase. The surprise winners Jos Sasse (Netherlands, 2:13:15) and Grete Kirkeberg (Norway, 2:35:44). 6759 messages – they get better. After his victory in Munich to win Herbert Steffny also the Frankfurt Marathon (2:13:51) at peak temperatures of 23 degrees. In the women’s Iris Biba (2:33:14) prevails. After reunification in 1300 East German athletes must arrive free thanks to title sponsor German Railway by train and start in Frankfurt. Overall Report 8042 runners and experience in wind and rain, the success of Konrad Dobler from Munich (2:13:29) and the Berliner Kerstin Preßler (2:34:13). Herbert Steffnys third match in Frankfurt, this time in 2:13:45 hours. Also on the second and third place run first German athletes. For women, the Belgian Linda Milo sets (2:35:11) by. Despite continuous rain and cool seven degrees of the Berlin Steffen Dittmann (2:12:59) provides on a new, faster course for a strong result. For women, the Norwegian Bente Moe (2:32:36) is the fastest. Stephan Freigang from Cottbus, the year before in Barcelona Olypiadritter, triumphs in German Jahresbestzeit (2:11:53). Sissel Sofie Grotto Mountain (2:36:50) in the women makes for a Norwegian “hat trick” in Frankfurt. Without title sponsor, with German championships, with a reporting record 9308 runners and with a world-class time for women: The Frankfurt Marathon 1994 has plenty to offer. Especially the beaming winner Franziska Moser from Switzerland who triumphed in 2:27:44 hours. For men, wins wet Terje (Norway, 2:13:19). The Frankfurt success story of Katrin Dörre-Heinig from Erbach im Odenwald begins. The Olympic bronze medalist from 1988 wins after injury lay safely in 2:31:31 hours. For men, the Russians Oleg Otmakov prevails (2:12:35). Eta’s new title sponsor. Katrin Dörre-Heinig wins in world-class time of 2:28:33 hours. But the headlines belong to the men’s winner Martin Bremer. The 26-year-old with his forces at the end, needed for the final two kilometers just under eight minutes crashes shortly before the finish tape – and saves four seconds ahead to the finish. Again a German double victory! For this triumph Katrin Dörre-Heinig (2:26:48) at its third Frankfurt Success in series and Michael Fietz (2:10:59) in each new course records. The Frankfurt Marathon has established itself thanks to strong results as the number two in Germany. The Kenyan Abel Gisemba can not by wind gusts up to 90 kilometers per hour stop, wins in 2:11:41 hours. 9069 runners have reported. For women, the Kenyan Angelina Kanana wins (2:31:38). The rollerbladers boom also covers the Frankfurt Marathon (new title sponsor: Bosch Mobile). At once the bad weather Este Pavel Loskutov come (2:12:37) and Esther Barmasai (Kenya, 2:33:58) the finish line first. The Ethiopian Haile Koricho runs on tattered stockings still in eleventh in 2:17:35. The Kenyan Henry Cherono wins new course record of 2:10:40 hours in Frankfurt running classic that now operates as a “Euro-Marathon”. His compatriot Esther Barmasai repeated their last year’s victory in 2:31:04 hours. For the fourth time Frankfurt will host the German Championships. And the naturalized Luminita Zaituc fetches in 2:26:01 hours in addition to the national title and the track record. The men’s winner as two years earlier: Pavel Loskutov (Estonia, 2:11:09). A new era begins: Race Director Jo Schindler experienced in its first year – the event is now called Euro City Marathon Messe Frankfurt – lousy weather conditions with gale-force wind. The woman winning time of 2:26:58 hours from the Spaniard Maria Abel is worthy of all honor. For men triumphs Eliud Kerling (Kenya, 2:12:32). 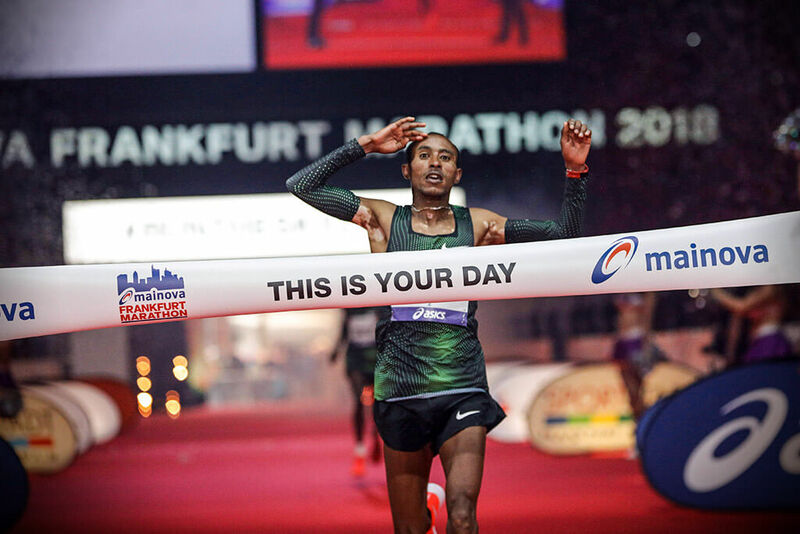 Many dreams come true: The initial atmospheric entry into the Festhalle is a success before enthusiastic spectators – and the Kenyan Boaz Kimaiyo screwed the course record in 2:09:28 hours. Winner Luminita Zaituc fights among women after 2:29:41 hours to finish. It is the first year for the VGF Relay Marathon. Again a new course record by Boaz Kimaiyo. The Kenyans needed this year only 2:09:10 hours for the fast Frankfurt course. With 15241 runners in all competitions of the weekend, the organizers also celebrate a new record. For women, the Russian Oleysa Nurgalieva (2:29:48) sets with only one second ahead through before her twin sister Elena. 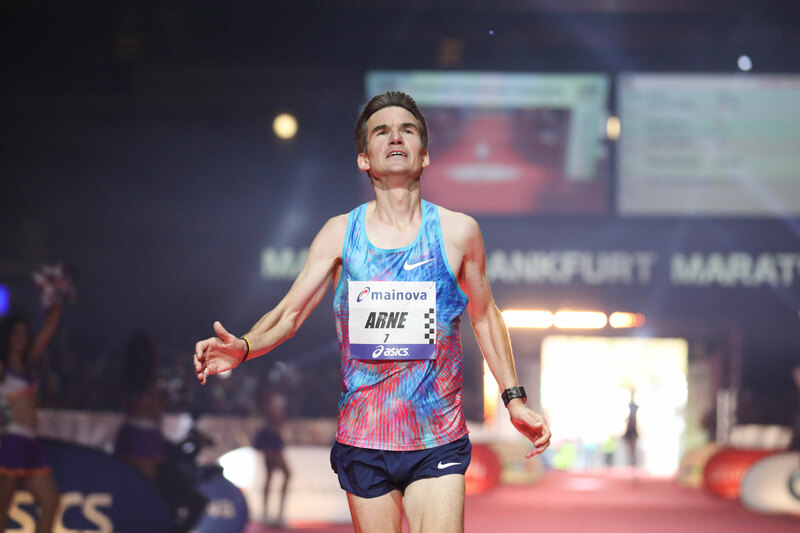 A Frankfurt Marathon of superlative: Two track records, reporting record (17195 participants), perfect weather, fantastic atmosphere in the Festhalle: The success of Kigen (Kenya, 2:08:29) – the top three remain under the old Kursbestzeit – and Alevtina Biktimirova (Russia, 2:25:12) remain qualitatively nothing to be desired. No track records for the 25th anniversary, but with 17478 messages a new record. Kigen of Kenya (2:06:06) won for the second time in a row in the Festhalle. The Russian “hat trick” on the Main makes Svetlana Ponomarenko (2:30:05) perfect. A new record lists the sporting goods fair Marathon Mall with nearly 40,000 visitors. Hattrick for Kigen! The Kenyan triumphed in new course record of 2:07:58 hours. For women, Melanie Kraus manages from Leverkusen to fulminant comeback a surprise victory (2:28:56), who brings her the Olympic qualification. Dieter Baumann is his first marathon in 2:30 hours. 18302 Athletes mean new record in trading under the name now under the Dresdner Kleinwort Frankfurt Marathon. The success story continues. The Kenyan Robert K. Cheruiyot achieved at the tender age of 20 in his debut equal the course record (2:07:21). Especially acclaimed is the victory of Mockenhaupt at its Frankfurt premiere in 2:26:22 hours. For the first time more than 12000 messages for the 42.195-kilometer stretch are submitted. The Frankfurt Marathon receives the first time the gold label of the International Athletics Federation – and fulfills the ambitious requirements today. At Commerzbank Frankfurt Marathon, there are again a new track record. The Kenyan Gilbert Kirwa reached after 2:06:14 hours the finish line in the Festhalle – the then third fastest time of the year marathon. When acclaimed career walkout by Luminita Zaituc Kenyan Agnes Kiprop wins (2:26:57). The Frankfurt Marathon has established itself definitively among premium events in the world. Wilson Kipsang from Kenya reached the Festhalle in sensational 2:04:57 hours – of course, a new course record. World class and Kursbestzeit also for women: The winner is Caroline Kilel (Kenya, 2:23:25). A stir well of the 99-year-old Indian Fauja Singh as participants an interreligious relay. A memorable year for the BMW Frankfurt Marathon and also a terrific 30th birthday. Last year’s winner Wilson Kipsang has even more to one and misses in the mythical time of 2:03:42 hours the world record by only four seconds. The Festhalle trembles! Even the second and third place remain under 2:06. The Ethiopian Daska achieved a new Kursbestzeit in 2:21:59. With 15210 Marathon registrations run classics am Main is the first time fully booked. The Frankfurt organizers have committed the current world record holder with Patrick Makau from Kenya. But temperatures just above zero degrees make the start a record race impossible. The Kenyans battling through and wins in 2:06:08 hours. For women, the Ethiopian Meselech Melkamu undercuts in 2:21:01 hours once again the course record. Again, no luck with the weather! Vincent Kipruto from Kenya wins in extreme wind and sometimes heavy rain in 2:06:15 hours – after a breathtaking finish with just one second ahead of compatriot Mark Kiptoo. Caroline Kilel (Kenya, 2:22:34) is the fastest woman in the field. The 7000 spectators at the Festhalle prepare the Hahner-Twins Anna (2:27:55) and Lisa (2:30:17) an inspiring reception. What a debut over 42.195 kilometers! The Tübingen Arne Gabius excited in Frankfurt with the fourth best ever spilled from a German athletes time: 2:09:32 hours. was so fast, no German before him at the first marathon start. Mark Kiptoo (2:06:49) of Kenya has this year in a once extremely thrilling finish the better end. For women, the Ethiopian Aberu Kebede wins in 2:22:21 hours. October 25th was a day of personal bests. Arne Gabius ran in 2:08:33 hours a new German record at Frankfurt Marathon and cracked the 27-year record of Jörg Peter. The Ethiopian Sisay Lemma won in 2:06:26 hours. In the women, the Ethiopian Gulume Tollesa prevailed in 2:23:12 hours in a heart-stopping on the red carpet. Only one step ahead of her compatriot Diknesh Mekash followed by Koren Yal (2:23:52), also from Ethiopia. Lisa Hahner won the German championship and improved in 2:28:39 hours her personal best significantly. Mark Korir won a three-way Kenyan contest and took the 35th edition of the Mainova Frankfurt Marathon with a time of 2:06:48. The 28 year-old beat fellow Kenyans Martin Kosgey and Cybrian Kotut who ran 2:07:22 and 2:07:28 respectively. Bobby Curtis of the USA took a surprise fourth place, equalling his personal best with 2:11:20 in ideal conditions. Mamitu Daska took Frankfurt for the second time after winning in 2011. At times the 33 year-old Ethiopian looked capable of threatening the course record of 2:21:01, but she slowed drastically in the final section after suffering of stomach problems earlier and finished in 2:25:27. Germany’s Ethiopian-born Fate Tola made up more than two minutes on the leader in the last few kilometres but could not quite catch her. Tola finished in 2:25:42, winning the German marathon championships in dominant style and became the fourth fastest German ever over the classic distance. Kenya’s Sarah Jebet was third in 2:27:07 while Lindsay Flanagan of the USA surprised with a fourth place in a big personal best of 2:29:28. 15,850 runners entered the Mainova Frankfurt Marathon which is an IAAF Gold Label Road Race. Ethiopian Shure Kitata Tola and Kenya’s Vivian Cheryuiot took the 36th edition of the Mainova Frankfurt Marathon. There were strong results by European men, headed by Britain’s Dewi Griffiths who produced a 2:09:49 finish for fifth place in his debut. In difficult conditions with some strong wind Shure Kitata Tola produced an impressive time of 2:05:50. He was followed by fellow-Ethiopians Kelkile Gezahegn Woldaregay (2:06:56) and Getu Feleke (2:07:46). While Welshman Griffiths unexpectedly headed the European challenge he was followed by Arne Gabius. The German took sixth place with 2:09:59. Poland’s Henryk Szost was seventh in 2:10:09. In her second marathon Olympic 5,000 m champion Vivian Cheruiyot dominated the race. The Kenyan clocked a personal best of 2:23:35. She had long been well on course for a course record (2:21:01), however she slowed in the heavy wind during the final section. Ethiopians Yebrgual Melese and Meskerem Assefa took second and third with 2:24:30 and 2:24:38 respectively. 14,513 runners from 108 nations entered the Mainova Frankfurt Marathon which is an IAAF Gold Label Road Race. Runner-up last year, this time the number one: the Ethiopian Kelkile Gezahegn won the 37th edition of the Mainova Frankfurt Marathon in cool and at times extremely windy conditions in 2:06:37. After a thrilling duel he broke away from Martin Kosgey of Kenya who finished in 2:06:41. Fellow Kenyan Alex Kibet finished third on his marathon debut in 2:07:09. A World Record for Masters or Veteran Runners was broken when Mark Kiptoo finished sixth in 2:07:50, improving the men’s Over-40 record by 48 seconds. Arne Gabius showed strong form to finish ninth in a high-quality field when the 37-year-old crossed the line in 2:11:45, the fastest time by a German this year. The top result of the day was achieved by the women’s winner as the 33-year-old Ethiopian Meskerem Assefa broke the course record with 2:20:36. That was 25 seconds faster than her compatriot Meselech Melkamu had run here in 2012. In a women’s field which produced high-quality performances in depth, Haftamnesh Tesfay of Ethiopia ran 2:20:47 for second place, also faster than Melkamu’s former course record of 2:21:01. Ethiopia achieved a clean sweep of the women’s podium when Bedatu Hirpa crossed the line for third in the Festhalle in 2:21:32. The leading German finisher among the women was Katharina Heinig who finished impressively in 14th place, just inside 2:30. Her time of 2:29:55 was the second fastest by a German woman this year. 13,934 runners from 102 countries took part in this year’s Mainova Frankfurt Marathon and, taking into account participants in the various parallel events, 26,826 were running in total. The Mainova Frankfurt Marathon is an IAAF Gold Label race, the highest category in international road running.